Camp Ramganga is a adventure riverside camp by Wildrift in the Ramganga valley in Kumaon region of Uttarakhand. 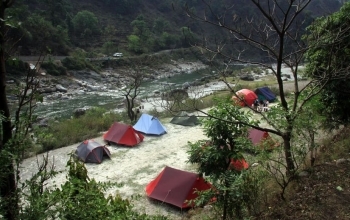 A quite different from the weekend adventure camp, Wildrift Camp Ramganga offers you a beach camping experience with several activities like campfires, white water Kayaking, fishing and swimming in river pools. 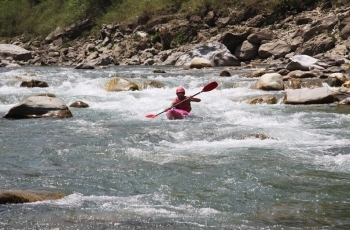 A perfect place to explore adventure and Ramganga valley, Camp Ramganga takes you to dense forest trek, secret cave explorations, high waterfall splash and body surfing with life jacket into a river gorge. Guests can plan a mountain biking and our trained instructors are always there to help. Camp Ramganga is located at Naachni village on Didihat Rd on the banks of Ramganga River. Munsiyari is at a distance of 30 kms from the camp. The camp provides American Safari tents and sleeping bags, cots, mats offered at the camp only. Toilets camp and bathing tents are available at the camp. There is a kitchen serving Indian, Continental dishes with some local Kumaoni cuisine as well. - Barbeque snacks @ Rs. 175/- per person per night. - Alcoholic / aerated drinks. - Any expenses of personal nature. - Drivers/maids/servants can be provided accommodation and food at an extra charge of Rs.1000/- per person per day. By Road: Camp Ramganga is in Naachni village and well connected by road. One can be reach at the camp via Kathgodam - Almora - Kaluwa Khan - Thal - Naachni. Kathgodam is at 8 hrs drive from the Camp covering a mountain road distance of 225 kms. By Rail: Kathgodam is the nearest railway station to reach Wildrift Camp Ramganga. By Air: Nearest airport is at either Pantnagar or at Delhi. Pantnagar airport is at 254 kms distance and Delhi International airport at 480 kms.